I wonder how many readers will remember much about this very lovely star of the fifties who rocketed to fame after being spotted as a waitress in a Lyons Corner House to film stardom alongside stars such as Dirk Bogarde, Richard Todd and Burt Lancaster. This is a fairy tale really but without the ending it should have had. Joan Rice died in January 1997 at the age of 66 . 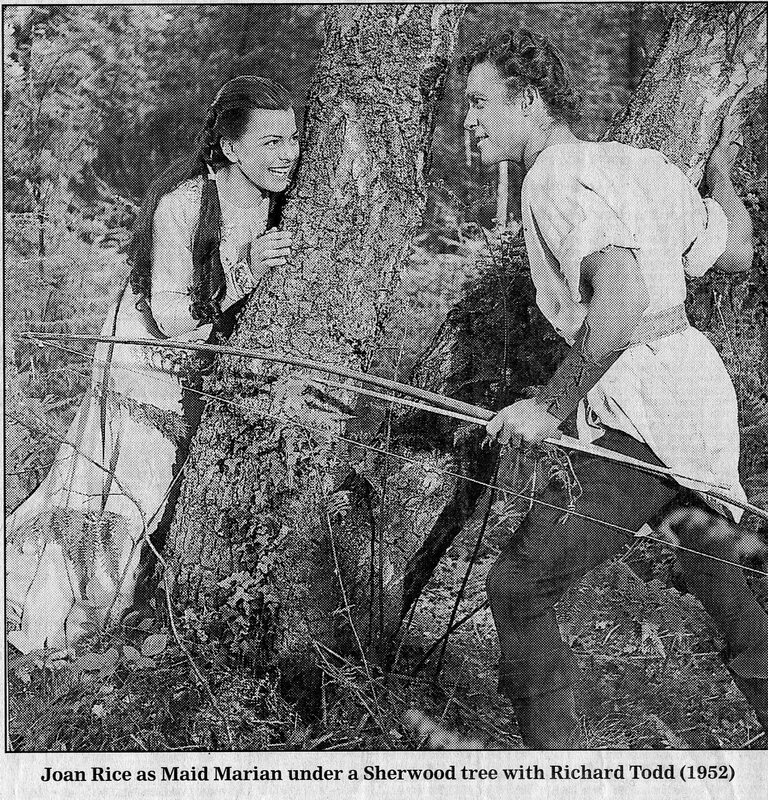 She was a Rank starlet of the 1950’s and her best remembered role was that of Maid Marian in Walt Disney’s The Story of Robin Hood (1952) opposite Richard Todd. Hers was a Cinderella story without the glass slipper. She was discovered as a waitress at the former Lyons Corner House in Piccadilly and signed to a film contract after winning the Lyons ‘Miss Nippy’ contest of 1949. With no formal acting training, she was sent to the Rank charm school and rushed into a stream of mostly minor roles in British films of the day. 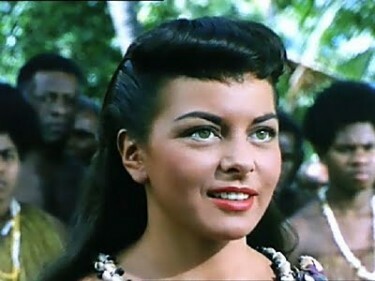 After The Story of Robin Hood she flew out to Fiji to make His Majesty O Keefe (1953) and starred opposite Burt Lancaster in a large scale Hollywood production set in the South Seas. 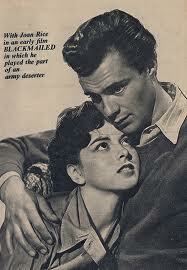 It was a very good colour film and she looked lovely in it. Joan Rice – above in His Majesty O Keefe. After she returned to England she met and married David Green very quickly and they had a son late in 1953. Her film career never seemed to get going again even after these two great roles she had. Joan Rice never found the role that might have established her on the international scene. She dropped out of the cinema in the 1960’s to try to build a life in provincial repertory. She claimed never to miss her movie career, and later in life, at the instigation of her father-in-law, she took up live acting to repair the omissions of youth. She toured in ‘Rebecca’ and ‘A View from the Bridge,’ her favourite play. She never attracted bad notices, but none of these productions reached the West End and she became a forgotten figure to many of the cinemagoers of the 1950’s who fondly recalled her English rose complexion and shapely contours. After seven years she abandoned acting completely because she disliked being away from home for such long periods. She was tempted into television only once – as a contributor to a ‘This Is Your Life’ show for Richard Todd, but dried up before the cameras and had to be steered through the programme by Michael Aspel. Joan Rice was born in Derby on February 3rd 1930, one of four sisters from a broken home. Her father was imprisoned for child abuse and she was brought up for eight years in a convent orphanage in Nottingham. After early experience as a lady’s maid and a housemaid, she left for London with half a crown in her purse and took a job as a waitress with Lyons at £3 a week. Balancing tea trays and negotiating obstacles gave a natural poise that stood her in good stead in the company’s in-house beauty contest. The prize was a week’s promotional tour in Torquay ( a town to which she returned 20 years later in a revival of ‘The Reluctant Debutante’ at the Princess Theatre). As winner of the ‘Miss Nippy’ contest, she was introduced to the theatrical agent Joan Reese, who went to work on her behalf and secured a screen test and a two-line bit part in the comedy, ‘One Wild Oat.’ Her first substantial role, however, was in Blackmailed (1950) – see picture below - a hospital melodrama, starring Mai Zetterling and Dirk Bogarde, in which Joan Rice played a good time girl. 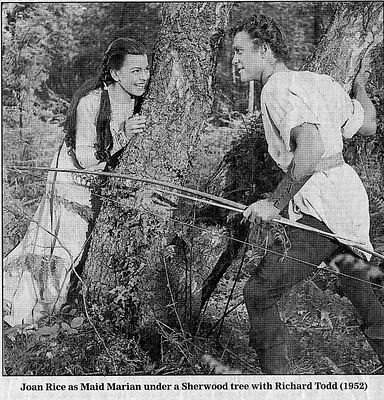 This film caught the eye of Walt Disney and he cast her as Maid Marian in The Story of Robin Hood – the best film part she ever got. Then she was whisked off to Fiji to star in His Majesty O’Keefe with Burt Lancaster – what an adventure that must have been in those far off days. Her other films included ‘Curtain Up’ (1952), about a seaside repertory company, ‘A Day to Remember’ (1953), about a darts team on a one day excursion to France, ‘The Crowded Day,’ (1954) about the staff of a department store coping with the Christmas rush and ‘Women without Men,’ (1956) about a breakout from a women’s prison. Only ‘Gift Horse’ (1952), a traditional wartime naval picture, had quality, yet her role as a Wren was subsidiary to Trevor Howard, Richard Attenborough and Sonny Tufts. In ‘One Good Turn’ (1954), she was wasted as a stooge to Norman Wisdom. After ‘Payroll’ in 1961, she effectively called it quits, returning for only one last picture, ‘The Horror of Frankenstein’ in 1970. After leaving show business, she lived quietly with her beloved Labradors, Jessie and Sheba, took work as an insurance clerk and later set up an estate agent, letting accommodation in Maidenhead through the Joan Rice Bureau, though she had only one member of staff. She smoked heavily and suffered from asthma and emphysema, which kept her largely housebound for the last six years. She married first, in 1953 (dissolved in 1964), David Green, son of the American comedian, Harry Green; they had one son. She married secondly, in 1984, the former Daily Sketch journalist Ken McKenzie. Until the last few years I had often asked the question ‘Whatever happened to Joan Rice’ and now we do know a lot more.